Contemporary chamber music for the English horn and the oboe d'amore with strings, oboes, & piano. Vivacious and liquid-smooth performances of some of the most elegant repertoire. 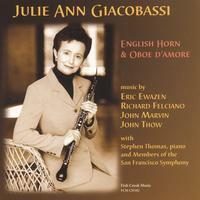 Julie Ann Giacobassi (b.1949), English horn player of the San Francisco Symphony since 1981, has been hailed as "an English horn genius" and "exceptional by any standard" by the San Francisco Examiner, and as a performer with "exquisite" and "silvery grace" by the San Francisco Chronicle. Conductor Herbert Blomstedt called her "a great artist and a great soul." Ms. Giacobassi began piano lessons with her mother at the age of five. Nine years later, she was attracted to the oboe and began studying with oboist Gail Warnaar in Muskegon, Michigan. Ms. Giacobassi continued her oboe studies with Florian Mueller at the University of Michigan, where she received her BA in 1971. Intending to make teaching a career, she moved to Shreveport, Louisiana, taught oboe at three colleges, and played principal oboe with the Shreveport Symphony. She made the change to full-time performance a year later when she moved to Washington, DC. It was during her ten years of freelancing at the Kennedy Center and her work with English horn player Richard White that she was drawn to the English horn. By the time she joined the San Francisco Symphony, she had made the English horn her primary instrument. The piece was written to show off Giacobassi's particular skills, especially her talent for shaping melodic lines with dark-hued eloquence, and it does so splendidly. Her performance was as vibrant, as serenely shapely and as precise as anyone could desire. Other solo performances with the SFS have included Copland's Quiet City, Honneger's Concerto da Camera, Farberman's Shapings, and Telemann's Concerto for Oboe d'amore. Ms.Giacobassi has recorded the Summit Records Orchestral Excerpts for the English Horn CD, part of the Summit Records OrchestraPro Series. Her transcription for English horn of the Bach Cello Suites has been published by Fish Creek Music. Other premieres include Harold Schiffman's Chamber Concerto for English horn and his Concerto for Oboe d'amore, which she recorded with Matyas Antal and the Hungarian Symphony Orchestra for North/South Records. Ms. Giacobassi can be heard on the Philips, London, Nonesuch, BMG and the SFS Media recordings of the San Francisco Symphony. Julie Ann Giacobassi plays a Laubin English horn and a Loree oboe d'amore, both with Lickman bocals. Ms. Giacobassi is accompanied on this CD by violinists Sarn Oliver & Yukiko Kurakata, violist Adam Smyla, cellist Peter Shelton, violist d'amore Geraldine Walther, harpist Douglas Rioth, oboists Evgeny Izotov & Roger Wiesmeyer, and pianist Stephen Thomas. English hornist Julie Ann Giacobassi has long been one of the San Francisco Symphony's greatest assets, but somehow that doesn't translate into a lot of recording opportunities (an out-of-print Argo CD of Aaron Jay Kernis' concerto "Colored Field" has been her main recording). Now she's come out with a self- produced disc of recent music for English horn and oboe d'amore, and it's a dazzler. Together with several of her Symphony colleagues, Giacobassi offers five beautiful and accessible chamber works, all done with the extraordinary verve and coloristic flair that has marked her finest playing. Chief among the delights here is John Marvin's "Music From the Night," scored for two oboes and English horn. The combination ought to sound merely quacky and graceless, but the deftness of Marvin's writing combines with the elegant playing of Giacobassi and oboists Evgeny Izotov and Roger Wiesmeyer to create haunting magic. For Berkeley composer John Thow's tender "Musica d'amore," Giacobassi is joined by violist Geraldine Walther and harpist Douglas Rioth in a sweet bagatelle, and Eric Ewazen's Quintet for English Horn and Strings starts the program off in an enchanting flurry of subtly flavored tonal melodies. The playing on this CD is breathtakingly beautiful. Giacobassi's focus and intensity in each note, the sense of phrasing employed, and the care to shading, work together to produce lines that grow and recede in the most naturally beautiful way. In slow movements, the longer notes sort of burn into the heart of pitch center before vibrating slightly with life and subtlety, always leading inevitably to the next note, and making clear a pulse even in the longest notes. involved plays at highest levels. A real find and one of my favorite recordings. These exceptional works highlighting the plaintive, evocative song of the english horn and oboe d'amore each provide these instruments with an ideal context in which to sing and interact with the alternating texture of piano and full orchestra. Exploring neo-romantic, impressionistic and harmonically-daring contemporary writing, the composers, not to mention this exceptional musician, give their all to this collection: a fine representation of contemporary repertoire that celebrates and challenges this highly lyrical and distinct family of double reeds with remarkable expression and elegance. The English horn isn't a horn and it isn't English--it's a wooden double-reed instrument pitched below the oboe. I used to believe that a combination of a double-reed and modern music was something to be dreaded, but my views have been changed! Ms. Giacobassi has great taste in performance and also in the selection of music for her album (Eric Ewazen's piece is simply wonderful). The quality of her playing could hardly be higher, and the pieces show that the art of writing lyrical music lives still. Ms. Giacobassi fills this disc (literally and figuratively) with all that a lover of double reeds could ask for and does it so well that I, a bass player, made this my first CD Baby purchase. Great music. Really beautiful, creative, engaging music. Not just background filler; it is compelling listening music.